We are one of the world’s largest teams of internationally recognised researchers and consulting engineers in offshore geomechanics. 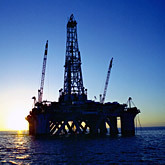 The Centre for Offshore Foundation Systems carries out fundamental research at an internationally recognised standard of excellence in the areas of the mechanics of seabed sediments, offshore geohazards and of offshore foundation and engineering systems, petroleum and renewable energy industries at both a national and international level. We work closely with leaders in the field around the world, working to bring the best minds in offshore geomechanics together.